Karen Horney (1885-1952) is one of the great figures in psychoanalysis, an independent thinker who dared to take issue with Freud's views on women. One of the first female medical students in Germany, and one of the first doctors in Berlin to undergo psychoanalytic training, she emigrated to the United States in 1932 and became a leading figure in American psychoanalysis. 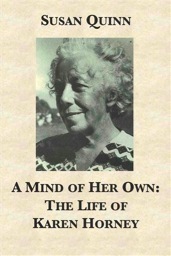 She wrote several important books, including Neurosis and Human Growth and Our Inner Conflicts. Horney was a brilliant psychologist of women, whose work anticipated current interest in the narcissistic personality.